Mac shipments are still declining more slowly than the overall PC market. But they are still declining  a fact that analyst Charlie Wolf of Needham & Co. believes may be attributable to the Mac's "wow factor" gradually fading. As a result, the Mac lineup may no longer be attracting many new "switcher" customers from Microsoft's Windows platform, Wolf said in his latest "Digital Lifestyle" report, provided to AppleInsider this week. Overall shipments of PCs shrank 11.3 percent in the second quarter of this year. Meanwhile, the popularity of Apple's iPad has helped turn it into the world's largest PC manufacturer when iPads are included. But the Mac has shrunk to just 20 percent of Apple's total PC shipments, when including the iPad. Wolf points out that Mac sales have been outgrowing PC sales since around 2005, when Apple's iPod ruled the MP3 player market. The "halo effect" from the iPod  and, later, the iPhone and iPad  got consumers interested in Apple's other products, and buyers of the iPod and iPhone sometimes went on to become buyers of the Mac. 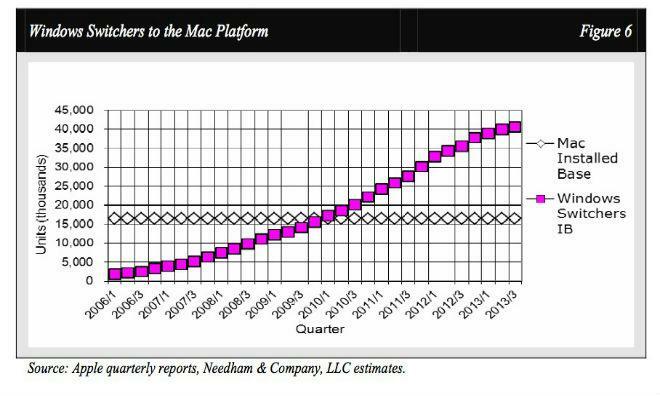 Wolf estimates that more than 40 million Windows users have switched to the Mac since 2005, a figure twice the size of the Mac installed base at the beginning of that period. Surveys conducted by Needham & Co. found that about 15 percent of iPhone- or iPad-owning Windows users actually go on to purchase a Mac, while 20 percent would consider switching. The effect may have been greater in the past, Wolf said, when the quality gap between the Windows experience and the Mac OS experience was greater. PC designs, though, have become "satisfactory for the 'jobs to be done'," and the PC market is struggling as a result. But at the same time, Apple's hardware and software advantages on the Mac platform may not appear quite as overwhelming as they did years ago, Wolf believes. He suggested that could lead some potential switchers to either stick with their current devices or to simply upgrade within the Windows ecosystem. "[T]he incremental improvements seem to have added little to the luster of the original models. While we believe the superiority of Macs over PCs continues, the shipment data suggest that Windows users' motivation to switch may have diminished. Apples challenge as we see it is to continue to introduce compelling new versions of iMacs and MacBooks. But thats a tall order given that the company has already introduced what in our view are virtually the 'perfect' machines for the PC market." The report also acknowledges that Apple continues to generate the lion's share of profit in the PC market. Apple's Mac lineup generates more profits than the top five PC makers in the world combined, according to a recent analysis. The company also continues to dominate in a number of segments, with its MacBook Air line taking 56 percent of its market section and the iMac continuing to set the pace for all-in-one desktop PC design.